When you have a pizza place that caters to children and families, you have to make sure it is truly a place for both kids and adults to have a good time and enjoy great food. This might sound easy, but it may surprise you as to how many places have trouble striking the right balance. For example, consider the décor of a pizza shop, The traditional look of a pizza shop does not scream child friendly. So, you should look for some other options for décor, and choose themes and colors that kids are going to like. You should have plenty of fun things for the children to do when they are at your pizza shop. Chances are that most children will appreciate being able to get up and move around rather than being stuck at the table. Having some games, such as arcade games or even carnival type games, in a section of the pizza shop is a fun idea. Perhaps some live entertainment or even some televisions playing cartoons could be a nice addition. You should make sure that the tables have some activities as well. Coloring books and games at the table can help keep the kids occupied. One of the things that kids and adults will both enjoy is making their own pizza. While you might not want to allow this all of the time, it can be a great activity for those who are having a birthday party in your shop. You can let the birthday child and all of the guests add their own toppings to their pizzas. Once they add the toppings, your employees can take the pizzas away to cook them. This will ensure that they will enjoy the pizza they made themselves, and it can be a fun activity as well. While you want to make sure that the youngsters have as much fun as possible, you can’t forget about the adults. After all, the adults are the ones who are bringing the kids to your pizza shop. You could have an area where the adults could relax if they need a break from the chaos of the game room. Make sure that they are still able to keep an eye on their children, even while relaxing. You could also feature some items on the menu that will appeal especially to the adults. 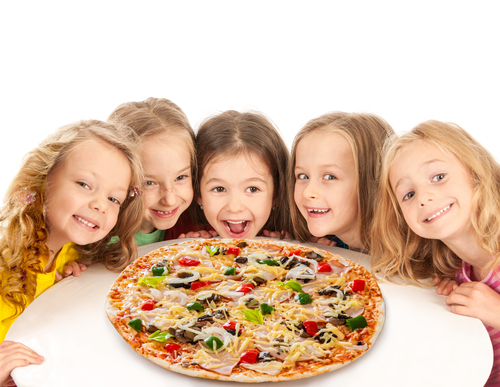 Chances are that you are familiar with some of the chain pizzerias that cater to children. While they often have some fun things for the little ones to do, the pizza and other food at these chains often leaves a something to be desired. If you really want to make your pizza shop the place for families to take their little ones on birthdays and just to have fun, make sure that the food you serve is great Great food and great times mean that people are going to tell others and that they are going to come back for more.